Disclosure: I received a product to help facilitate the review. All opinions stated are genuine and my own (or in this case, my oldest son's). My husband has a new car, I do not. In fact, my vehicle is really pushing it on miles. But it is in perfect condition looks-wise, and it gets us where we're going (knock on wood)...and since hubby is the only one with a consistent income since we moved (*sigh*) I'm keeping it until a). it dies b). I am lucky enough to get hired in Higher Ed. Admin. (easy to do in our old big/busy city, NOT easy to do in our new rural one...but I digress, I know). 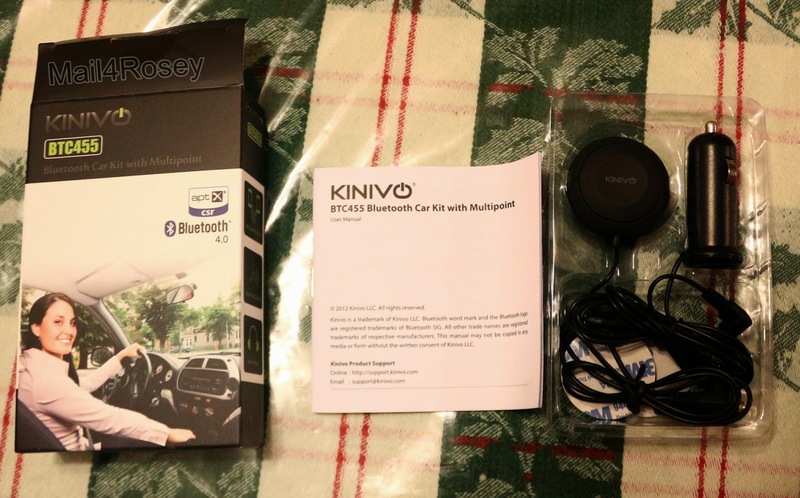 The fact is though, that my car is so old it oft times is incompatible with the newer devices, such as the Kinivo BTC455 Bluetooth Car Kit being written about today (the device requires a 3.5mm input jack in the car stereo and my car doesn't have it). This is what comes in the box. Super easy to Install! This bluetooth device was well packaged and organized. The instruction manual was easy to read and understand. Installation: To install this bluetooth device you simply plug the power device into the cigarette lighter port of your car, which by the way has a USB port on top so you can charge a device while using the Bluetooth device. Then you plug the headphone jack into the correct port on your vehicle. Double sided tape is provided with the kit to install the microphone unit. 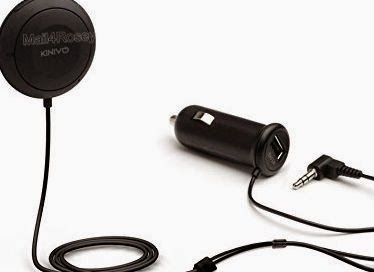 Use: To use this voice command device you simply place the vehicles stereo on AUX and you are in business. This bluetooth device allows the user to not only send and receive calls, but also allows music to be played via a bluetooth device. No more CD's for the owner of this device, Pandora all the way!! is available on Amazon (photo source). Recommendation: I would recommend this product to anyone whom has a vehicle with a headphone jack that does not already have built-in bluetooth capabilities. This device is easy to use and allows the user to even change songs from the circular device shown in the photograph. Know that the circular device is also the microphone for the user’s voice so ensure it is placed close enough to pick up speech during phone calls. A big thank you to my son for testing out this product and giving me the write-up. Connect 2 phones via Bluetooth at once (photo source). I love that the multi-point pairing allows you to connect up to two Bluetooth capable devices simultaneously. That means you can play music and answer calls from two separate audio sources wtihout disconnecting and pairing over and over again. I also appreciate that it supports so many Bluetooth Profiles (HFP, HSP, A2DP, and AVRCP). You can use it with Apple, Android, Blackberry, etc. AND, I like that it comes with a 48-inch auxiliary cable and 24-inch extension cable to allow for convenient placement. The BTC455 Bluetooth Hands-Free Car Kit comes with a one-year warranty. You can learn more about Kinivo by visiting their website (or visiting Amazon). You can also follow them on Facebook and/or Twitter. Chris and I were just talking about getting one of these. It sounds like a handy thing to have! This is so convenient and so much more safe! My daughter needs this. Our city just made it illegal to drive and talk on the cell phone. I need one of these in the car. It's safer when you are hands free. Such a necessary item in todays driving world.. never touch your phone while moving! That looks great. I have to be on the phone a lot for my business. Now I won't get pulled over! This is a great post and I really appreciate the explanation and pictures. I think I need one of these. I really wish this was mandatory. You do not know how many times i have almost gotten run over on my walks, and runs every day due to idiotic people on their cell phones. I'm surprised more people aren't pulled over, so many people here in California are constantly on theirs and it drives me mad. Where I used to live (Canada) it was completely illegal. My phone syncs directly to my car stereo so I don't use these, but it's a great alternative. No one should be handling ther phones while driving! Hands-free is a way to be!my car has Bluetooth through the stereo to but I usually just put it on speaker. In my Hubs truck he already has the Bluetooth, but we have 2 more cars that I could use this in. I don't even have a phone. Don't want one either. Honestly, I think that is great that you do well in these times without a cell phone. My mother doesn't have one either and as we struggle through winters and she gets older, I sure wish I could get her to get a basic one so she can call someone should something happen to her. Two sources - that's a plus. That's a pretty nifty car kit. I bet even I could figure it out and I'm not the most tech savvy person. A great tool, thanks for the review. I don't have a Bluetooth device, but this sure looks like a nice one, and I could really use it. What a great kit for the car! We don't have a car but if we did I would love something like this! I may have to get my daughter one of these for graduation soon. How great to get your son involved! My husband needs a hands free kit so bad - This one looks great! This is a great alternative if you don't have built in Bluetooth. I know my husband was not happy when his car didn't have it and mine did. What an awesome device. I could definitely use that. Thank you for sharing. Welcome is in order for your son! He did great on the review :) I don't use my phone in the car ever, but Jason does. A good Bluetooth is a must, especially when you travel as much as he does! I need like this for my car! People are always calling me while I’m driving! My son has a Kinivo portable speaker and loves it. I am sure this bluetooth is a great product, too! What a useful thing to have. I can think of multiple cases where this would have been helpful for me. Neat. This looks great to have. Will make your ride easier and safer. Great Job to your Son on the review. there are so many accidents because of using the phone while driving that it's ridicules, we need to educated and spread the word no to do it and if so to use this product or something similar that will keep the eyes on the road and not on the phone. I really need to start using a bluetooth in the car. I have had a couple in the past, but never really put them to use. I love that you can link up two devices. That has always been a pain with syncing in the car. Thanks for the review. I'll have to check it out. That would be so helpful on long commutes. I'd love to try this out myself. You don't realize how quickly you adjust to having certain technology until it's not available. My husband's car doesn't have bluetooth and it is always a drag driving his car. This sounds like a great option for his car. Well done to your son for writing a nice review post. I do not yet have a car but i do love the idea of bluetooth for drivers. You are required in california to only talk hands free in the car. This would be a great way to do it. I was really bummed that I couldn't get blue tooth put in my car. I am now so happy because I can just buy a system like this! I have a new car that is bluetooth enabled, but my husband and daughter have older cars. I am sure that someone in this household could definitely use that. Sounds like an incredible piece of equipment. Thanks for the head's up, Rosey. If this is a duplicate comment, sorry. My poor ole computer is stretched to its limit. Looks like that could be pretty useful! I don't currently drive since we're living downtown, but I could see where it would be useful for those who do. That really does look like a handy tool to have. I don't drive so this wouldn't be something that I need. My husband needs this. His talking and texting drives me absolutely nuts. He seems to think he's invincible and nothing will happen to him. Omg this is definitely something I need! I live in NY and you can get a ticket if on your phone and driving at the same time! Wow - congrats to your son - great review - makes me want one, except I do have a new car - and my husband's truck doesn't have the goodies to use it! So very cool though! Kinivo has some really neat gadgets! I love how handy this is! Fabulous post. These look like they will be so handy and make it so safe. Knock on wood to my car too. I don't have an input jack either but I'm not going to complain about my baby one bit. ;-) Nice review for me to wish upon ;-) I wonder if I could get used to talking out loud in the car though. My phone syncs with my car. Still, this would be great for my husband's car, which doesn't do that! I've been thinking I need something like this for all the time I spend in the car. How cool. 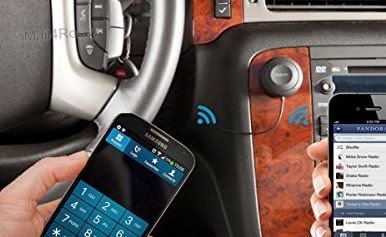 I need to get this for hubby cars he would flip for it..
That's great that you can connect two devices. It's super helpful to have bluetooth in the car. This is great. It can make life easier and a little safer. You can't be safe enough while driving. I think everyone needs to use some sort of bluetooth device instead of talking on the phone and driving! I need this! I have been debating on getting a bluetooth device! I could definitely use this for my daughter's car. She's the only one who doesn't have bluetooth already. This is a great hands-free product. I hope it will deter many drivers from picking up their phones while driving. I so need one of these in my cars. I am always on my phone when I am driving. Thanks for the awesome review. Sounds like a great handsfree kit. I could use one in my car. Hands-free talking is so important. Thanks for sharing this alternative. I need something like this in my car. It's older and doesn't have the features new cars have so I'm stuck holding my phone. It's not good, because I have my girls and there are always so many distractions. It would be nice to take calls hands free for a change. I could definitely use this! We have a bluetooth in one car but we need another. This looks great. Hello to your oldest son! I think this is something that my brother would find a lot of use for. I also like that it allows you to connect two devices at the same time. This looks like a really great tool to have if you do a lot of business from your car. I have been looking for a nice Bluetooth hands free device. Oh I absolutely need one of these for myself and for my husband! This would be especially nice for when I'm waiting in the car forever for my kiddos to get out of school, lol! I love all the new technology available! This looks like a great product. My husband would enjoy it! I'm sure my husband would love this handsfree car kit. We're in the same boat as you are - car is too old for bluetooth OR an auxiliary port. These are handy devices if they work in your vehicle though.